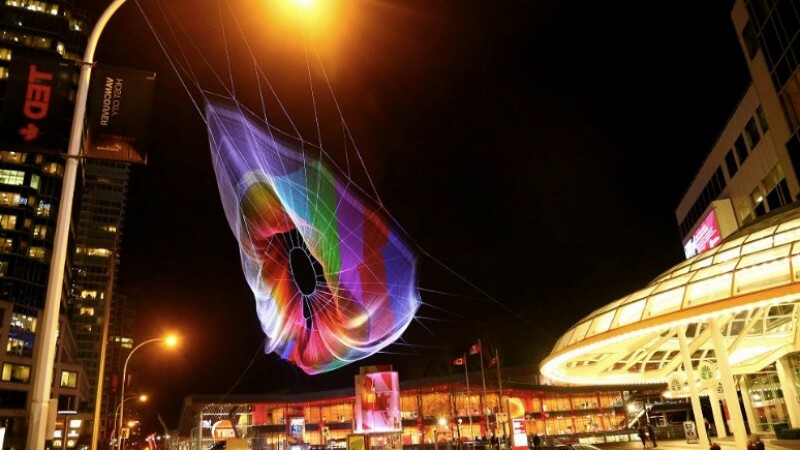 A stunning, revolutionary art exhibit by Janet Echelman is creating quite the buzz in Vancouver! Set up as part of the TED conference, this “sculpture” features an interactive light display created by Google, that allows regular viewers to essentially “paint” it with their smartphones! We got to work with GRAiNEY Pictures and Google to film this impressive art display. It was a very exciting project in many ways. It required us to fly our helicam during night time, directly over the water! And the location was right in the heart of Vancouver’s waterfront, close to the harbour and extensive floatplane traffic. We had to coordinate very carefully with Air Traffic Control and take all the appropriate steps to ensure we had the proper permits in place to fly there. It was a pleasure working with GRAiNEY Pictures and Google – we hope to do it again!